For centuries, peoples of the circumpolar North lived in semi-nomadic communities, moving from place to place as food availability shifted with the changing seasons. People relied on their surrounding environment for food and other materials through hunting, fishing, and gathering, their fortunes closely tied to the seasonal changes in the seemingly barren landscape around them. It was not often an easy life, but it was one deep-rooted in ecological knowledge and traditional life ways. About a hundred years ago, many of these semi-nomadic communities began to be pressured into settling in permanent locations under state-induced policies that sought to stabilize the economy and mainstream the native population. The United States, Canada, Greenland, and, to a lesser extent, Finland and Scandinavia, attempted to assimilate native communities into the mainstream population by forcing an immobile lifestyle in which native families were required to send their children to state-run schools. Established communities were sometimes relocated again at the whim of far-off policy changes. Between the 1950s and 1970s, the Soviet Union relocated hundreds of small indigenous Siberian communities in order to make the administration of these places more convenient, reasoning that it would be easier to control the birth rate if peoples’ whereabouts were known, particularly if they had come to rely upon government rations and services. What were the impacts of these government-sponsored relocations? “Moved by the State: Perspectives on Relocation and Resettlement in the Circumpolar North” (MOVE) is an international project within the BOREAS scheme of the European Science Foundation. Peter Schweitzer, a professor of anthropology at the University of Alaska, Fairbanks (UAF), leads the overall MOVE project as well as the U.S. portion funded by NSF and housed at UAF. He and his team of post-docs and graduate students are working to answer the question raised above. They study the physical, psychological, and economic consequences of state-induced relocation in 20th century Chukotka, Russia, and Alaska. But they are not just looking back. By documenting experiences of indigenous peoples in Alaska and Russia, the MOVE team hopes to assist coastal communities in Alaska and elsewhere to cope with pending relocations resulting from climate change. Post-doctoral research fellow Tobias Holzlehner, who has worked in Chukotka since the 1990s, is documenting historical relocations there by collecting sometimes heartbreaking narratives and by travelling to and studying abandoned settlements, an easier feat following the disbanding of the Soviet Union. Schweitzer attended the Beringia Days conference in Andyr last September. While there, he focused on reestablishing relationships with indigenous elders and government officials, who are cautious but helpful because they realize that his project has relevance to their lives. Coastal Alaskan communities have a long tradition of being adaptable to changing environmental conditions--a good thing given the state of the coastline. The State of Alaska currently monitors more than 30 communities identified as potential candidates for relocation. 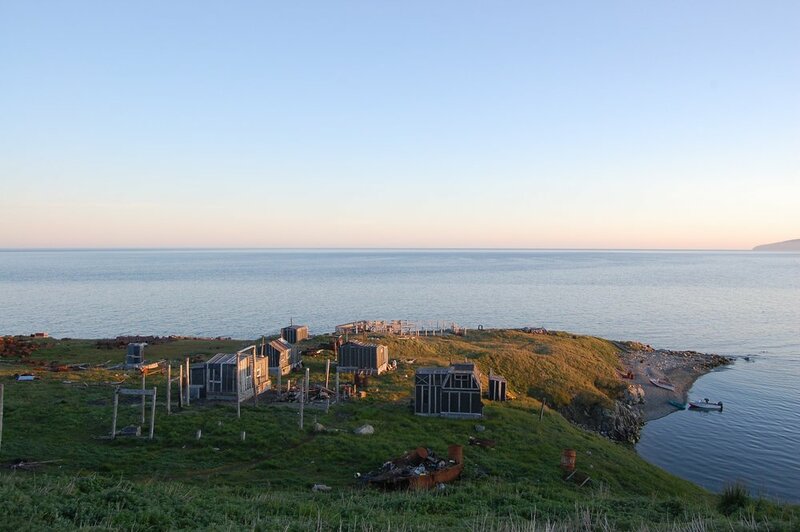 Neither the state nor these communities want the move (an important contrast to Chukotka), but relocation may become necessary for many as beach erosion and thawing permafrost intensify with climate warming. The problem, says Schweitzer, is that unlike a hundred years ago, native Alaskans are now stuck in an “infrastructure trap” with their reliance on many modern conveniences as well as a strong sense of place. Ph.D. student Elizabeth Marino works in the community of Shishmaref, one of several Alaskan villages the MOVE project works with; Shishmaref clings tenuously to the northern coast of the Beringia Land Bridge National Preserve. 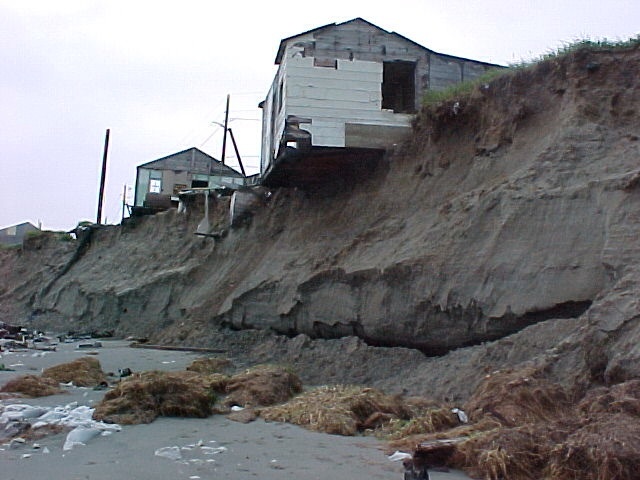 On a sand and permafrost barrier island three-miles long and only about a thousand feet wide at its narrowest point, Shishmaref is highly susceptible to beach-front erosion. Although people made camps on the island 4,000 years ago, no permanent settlements existed until the turn of the century with the opening of a post office in 1901.